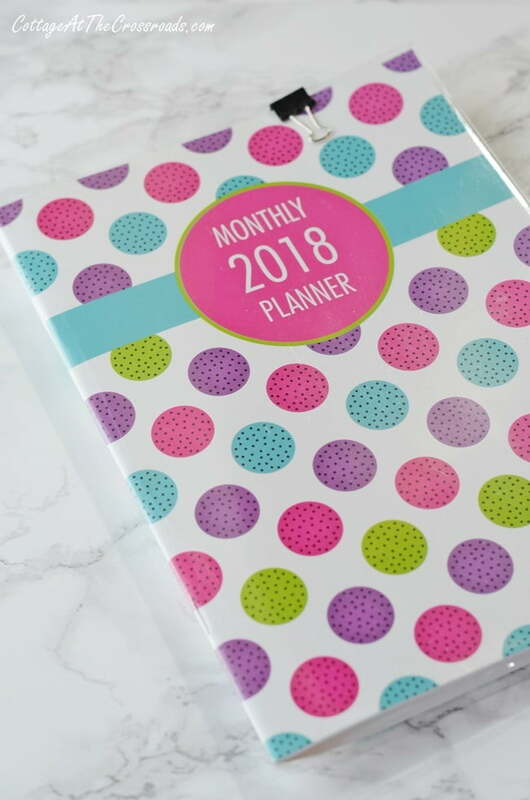 January is a month that people focus on getting organized so I thought I’d share the 3 planners that I’m using to stay organized. That’s right. 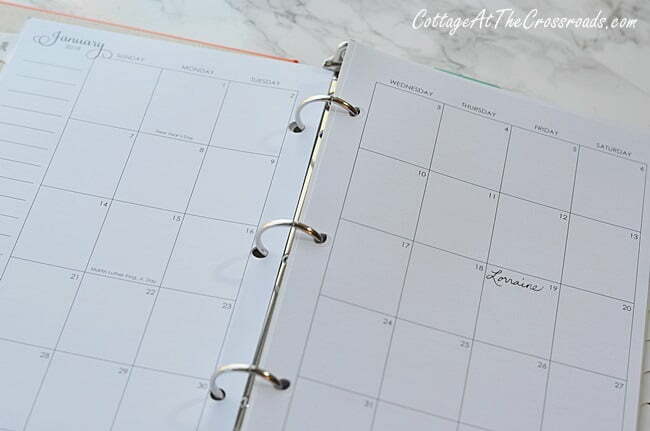 I’m using 3 planners to stay on top of things this year, two of which I’ve been using for several years, but I’ve added a new system specifically to keep our blog organized. 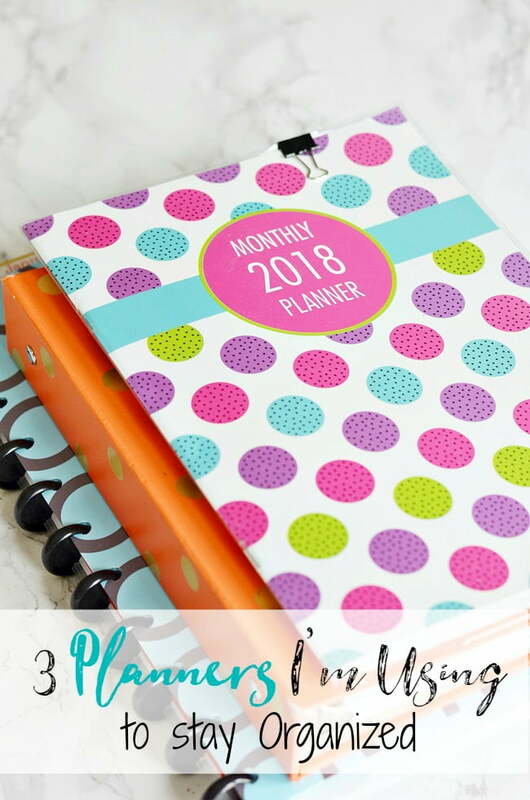 Although there are many of them out there, I’ve always resisted using a blog planner for the entire 7 years we’ve been blogging. That’s probably because for the 31 years of my teaching career, I had to keep a lesson plan book. 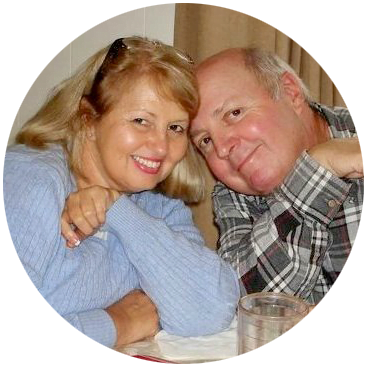 And when we started the blog, our purpose was to simply share what we were doing around the house here at the Crossroads. I’m not sure that blog planners even existed back in January of 2011! 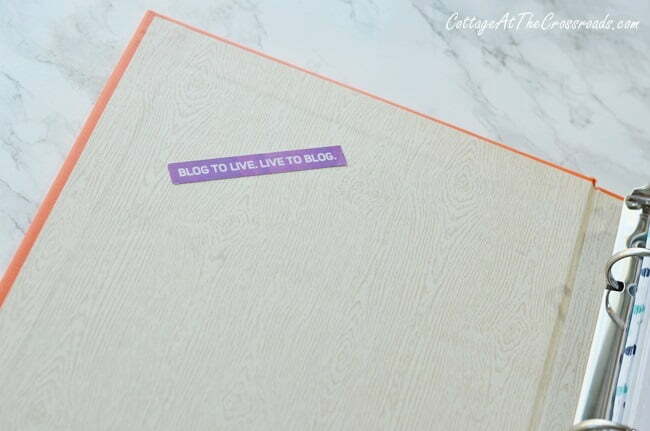 But I’ve set up a blog planner for the first time in our 7 years of blogging!!! 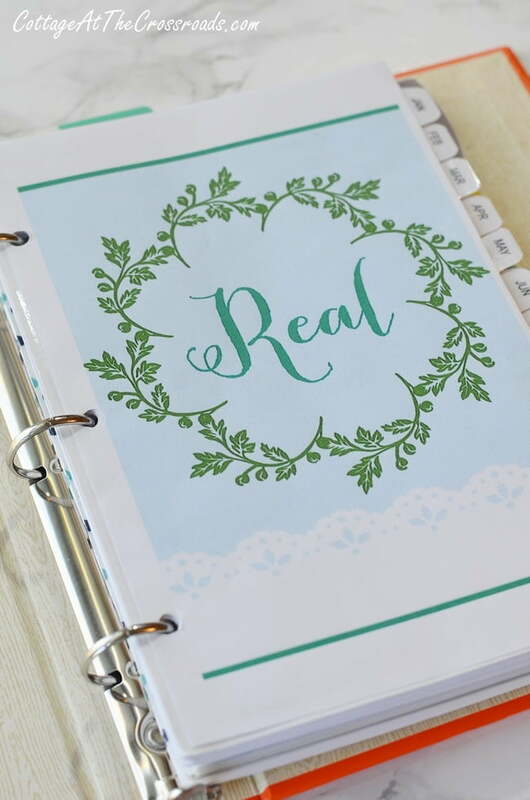 I used an ARC customizable notebook from Staples to set it up, and I’m so impressed with these notebooks that I plan to do a whole blog post about them. These notebooks have been around for a few years now, but I was totally in the dark about them. I just can’t keep this good info to myself! 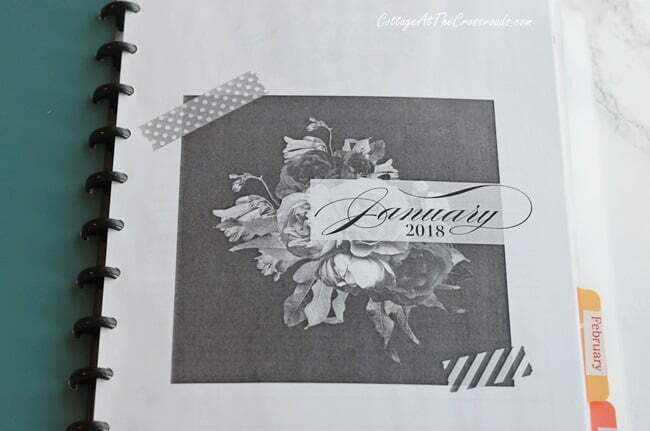 The actual pages inside are from Jennifer Carroll’s Blog Planner (available now at a special introductory price of $4.99) that I had printed at my local Office Depot. I chose to have it printed in black and white (I’m cheap that way!) but it would be gorgeous printed in the beautiful colors as she designed it. 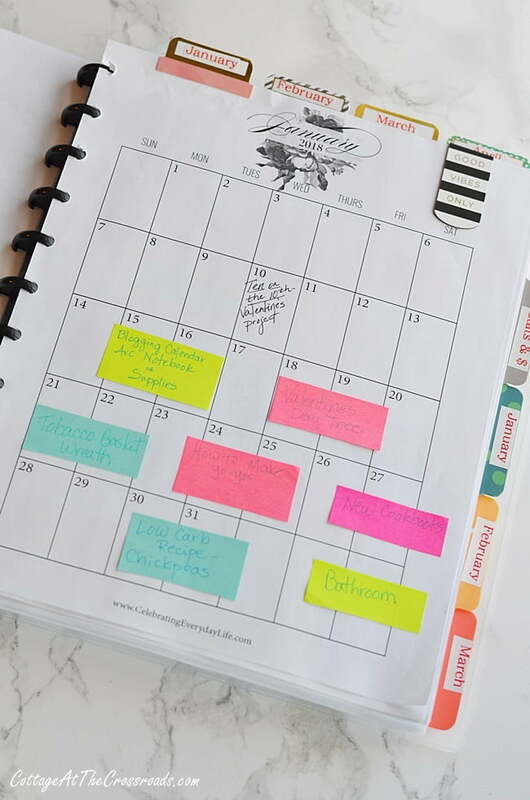 Her planner includes long-term goal setting pages, monthly calendars, and monthly statistic trackers. I have never been one to track our blog’s stats but I do admit to looking at them occasionally. I also like these income and expense tracking pages. 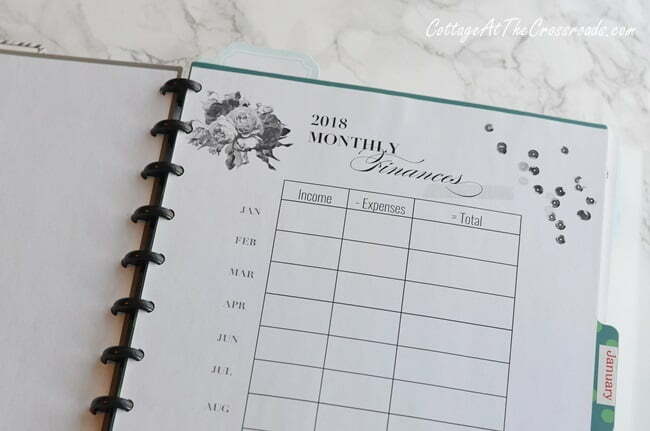 I know many of you reading this post aren’t aware of the expenses of blogging, but they can add up quickly! Luckily, the ads that you see running on our blog do help to offset those expenses! I’ve never had a long range content planner, either! But you can see how I’m using the monthly calendars to plan upcoming posts. The sticky notes can easily be moved around. Right now, the colors have no meaning but it did occur to me that I could color code the types of posts such as recipe posts, craft posts, gardening posts, etc. 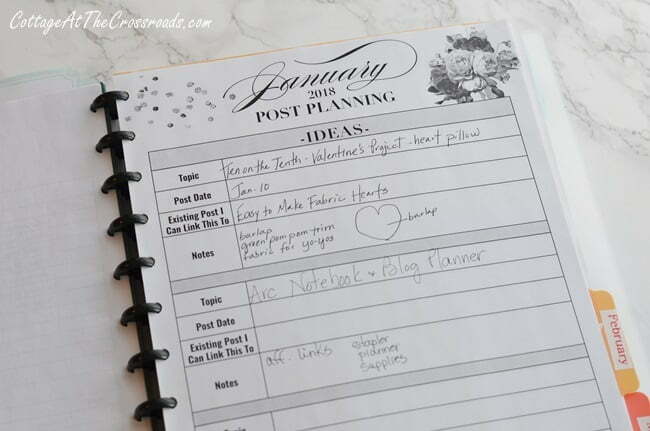 One of the most useful things in Jennifer Carroll’s blog planner is the post planning pages. Here I can jot down supplies needed for an upcoming craft post or affiliate links I can insert for your convenience. 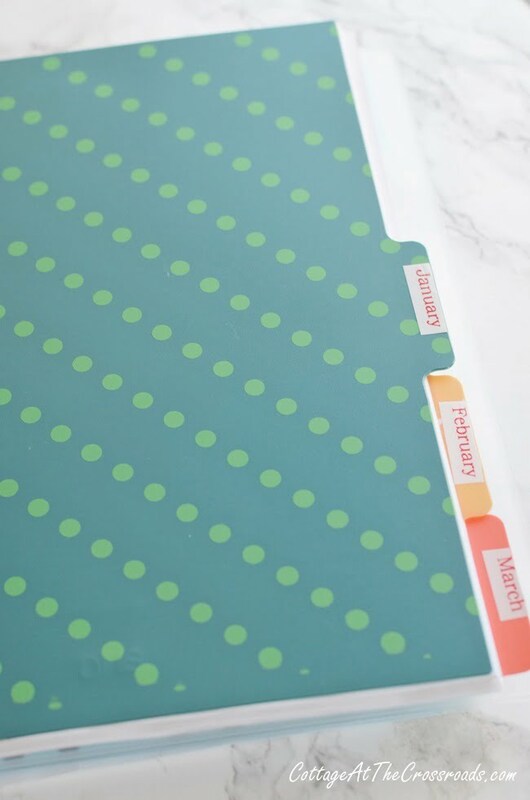 I’ll talk more about the dividers when I do a post about the ARC notebook system, but you can see that I used my (affiliate link) Brother P-touch Label Maker to make the labels. 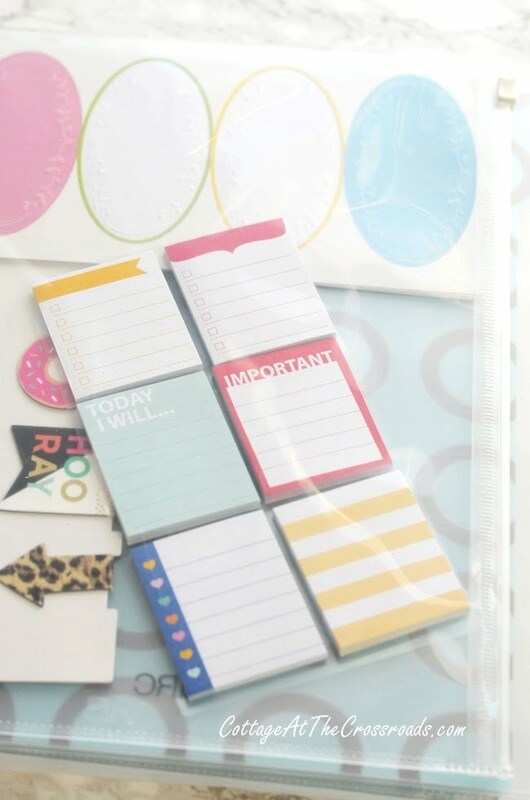 I added a plastic pouch into my blog planner to hold sticky notes, labels, magnetic page holders, pens, etc. to have everything handy when inspiration strikes! 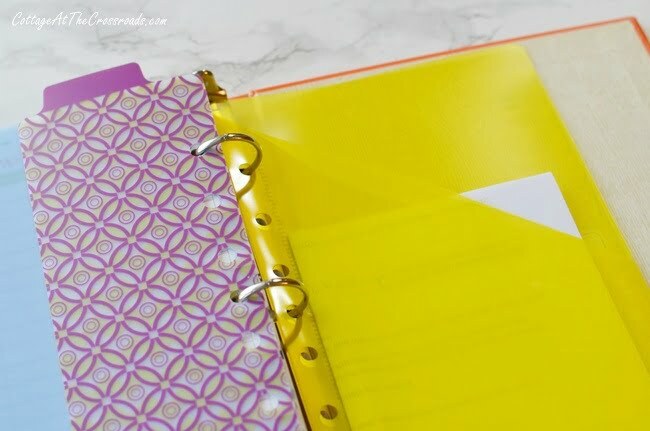 The second planner of the 3 planners I’m using to stay organized is a 3-ring mini binder otherwise known as a half size binder. You can see from the photo that this one has been in use for a while and is a little worn. That’s because I reach for it and use it almost every day. 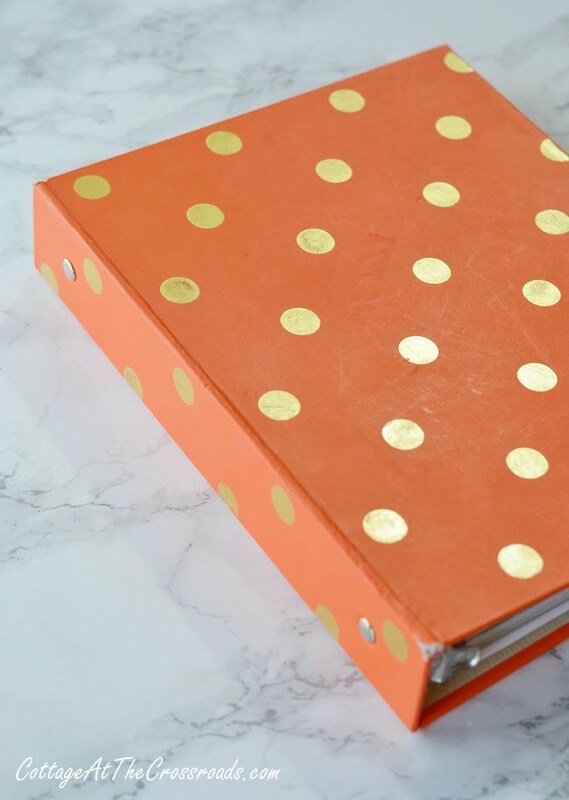 The orange mini binder has served as my “blog planner” for the past several years. On the inside is last year’s Word of the Year which I’m continuing with this year. Inside are blank calendar pages where I make note of when certain posts need to be published. I also use this as a quick reference because it stays in a basket beside the chair where I sit when I work on the computer. I did want to mention where I got the calendar inside. I ordered it from the Etsy shop ptpaper, and the pages come preprinted and prepunched to fit mini binders. The section that I use almost daily is the password keeper. Last year I found these pages in an Etsy shop and printed them at home. I made my own alphabetical tabs using “flags” and my label maker. Seems like I’m looking in my password keeper daily. 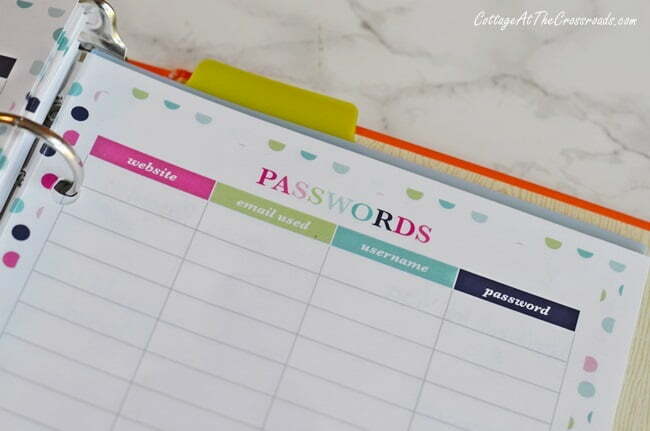 You wouldn’t believe how many passwords a blogger needs! I also keep plenty of (aff. link) lined paper for taking notes in the mini binder along with plastic bookmarks and divider pages with pockets. 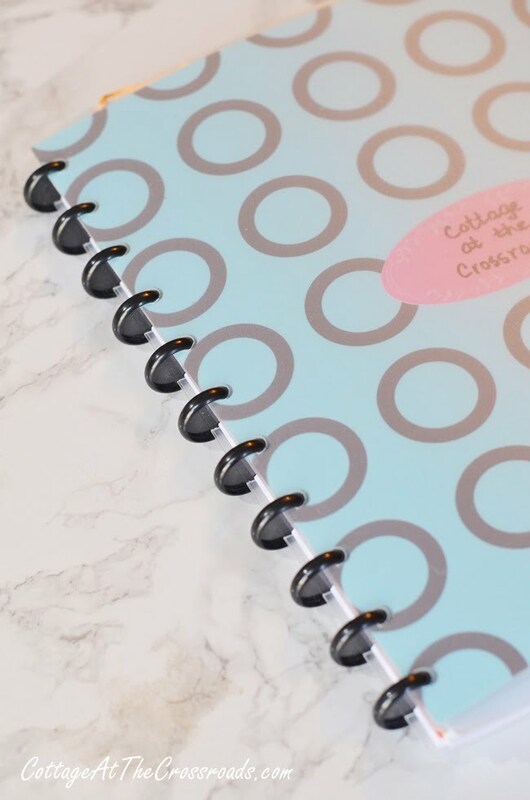 You can find the mini binders at Walmart, Target, and office supply stores along with some of the Avery mini binder supplies. 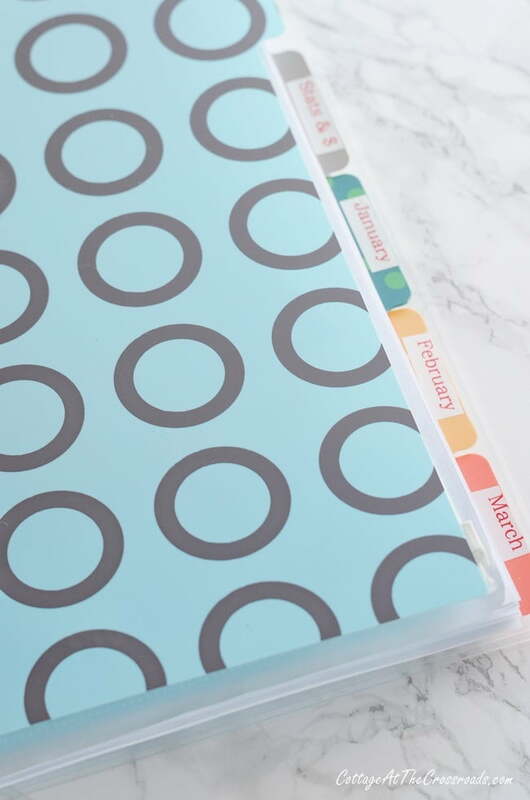 Mini binders are a great way to organize so many things and are easy to use, take, and store because of their smaller size. 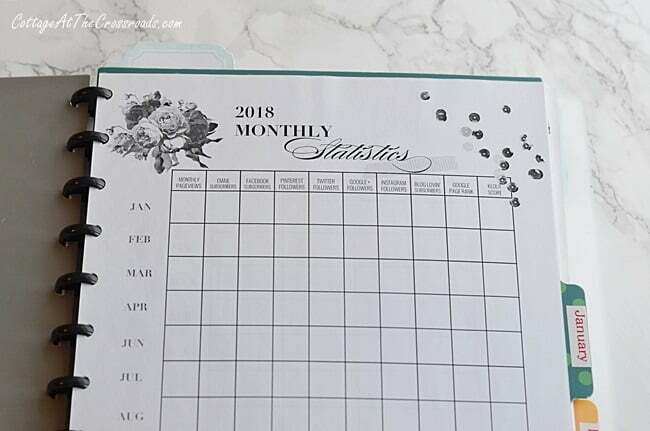 The last thing that I use is this inexpensive monthly planner that I purchase every year from the Dollar General store. It is used to keep track of personal things such as appointments, birthdays, and special events. It stays in my purse, and as soon as an appointment is made, it goes down in my planner. This is very important so that no overlapping appointments are made for Leo, my mom, or myself. 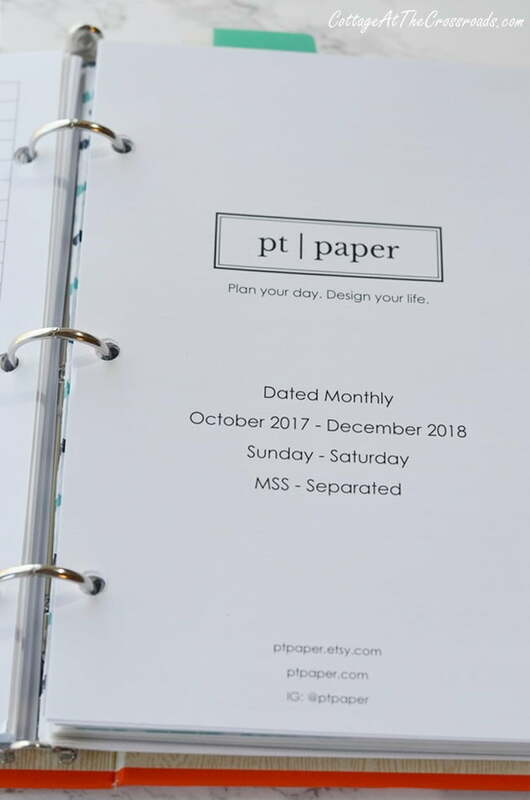 I hope you’ve enjoyed seeing the 3 planners I’m using to stay organized. Look for another post soon about the ARC notebooks. I am really liking how versatile they are and how they can be used for many things other than planners. And while I’m planning future blog posts, what types of posts would you like to see more of in 2018? Gardening, crafts, seasonal decorating inspiration, thrifty ideas, recipes, or just real life around here at the Crossroads? I’m learning from this post! I saw in your blog planner that you considered what past posts you could link to. That’s such a great idea! Love your organization. 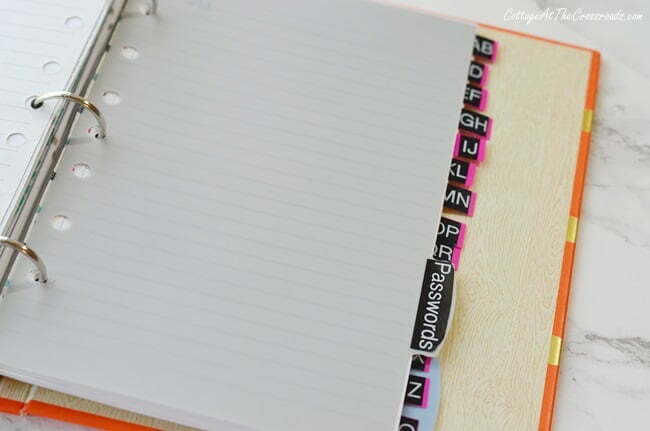 I came across an old address book, from Hallmark, that wasn’t being used and decided to use it for passwords. Seems to work for now. Only problem is that it stays at home and sometimes I need the password when I’m at work. I may try out Dashline, like Libby suggested. But I won’t be getting rid of my hard copy, no matter what else I use. Yes, I agree, I’d have to keep a hard copy of our passwords! Just one word re. passwords. I have used Dashlane for many years. It automatically fills in the passwords, ID, whatever, once you have registered that site. And they have never been hacked, and only YOU know your master password to get in! Just a thought..
Good to know that they’ve never been hacked! I’ve been leery of storing passwords online for that reason. I love all of your posts. I can’t wait for gardening even though I no longer have a garden except for flowers. Thank you, Francis! We are scaling back our garden this year, but I’m like you, I must have lots of flowers! I certainly do not miss writing in my teacher daily plan book!! Probably why my calendar book is often closed! I write in it, however keep forgetting to check it! The one in my purse is also a forgotten tool! And to have one for blogging? You are one organized gal!! I don’t miss those plan books either, but I still have my love of office supplies! Lesson planners! I don’t miss that at all, especially the ones I was having to do on the computer before I retired. They took more time than the teaching. I love seeing photos of your garden, but the truth is as a reader of bloggers I am addicted to reading about other’s real lives. I wonder if it replaced my stories of the day! You are always so creative and I love that too. 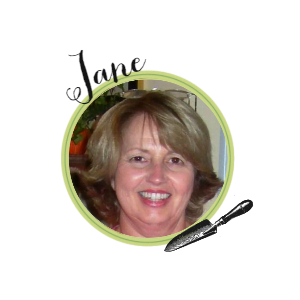 Sandy, I’m glad I retired before I had to do lesson plans on the computer! I’m a paper and pen kind of gal! I enjoyed this post. Wish I could be this organized. sigh…My husband and I use a Rolodex for our passwords and other similar info. That works well for us. Jane, do you have a desk area? Using a Rolodex is a great idea. I’ll pass that one along to Leo who has claimed our desk in the bedroom that we turned into an office. I do most of my planning and blogging from my chair in our living room!